Today began at 4:10am, long before sunrise or my natural waking time, but this is the only way I can count on getting a workout on weekdays. I arrived at the gym late enough that the lifeguards had already broken up the layer of ice on the top of the pool so I could hop right in. (Ok, yes, I’m exaggerating just a tiny bit – it is an indoor pool.) My back fussed about the swimming until I caved and thawed out in the hot tub after a mere 30 minutes. A 30 minute swim has been all my back will tolerate for months. Work went smoothly, especially for a first day back after a long weekend. It was great having leftover broccoli stalk pancakes for breakfast and another B.A. Salad for lunch (I made 2 salads yesterday at lunch). Tonight my husband grilled grass-fed beef burgers topped with blue cheese, which were juicy and delicious. 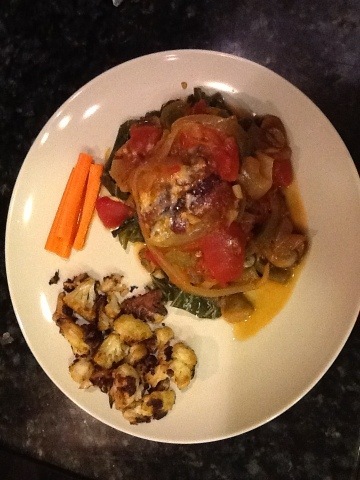 I had been craving the cacciatore sauce all day, so I made a burger cacciatore! 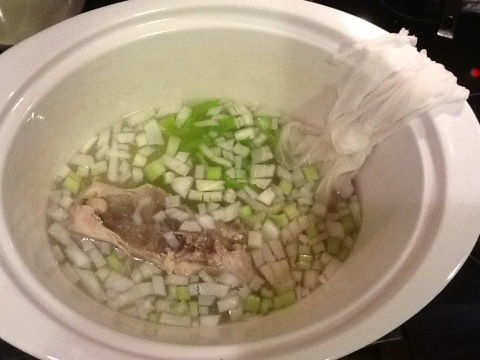 It bugged me to waste the chicken back last night, so tonight I am making a white stock in the slow cooker. Wish I could post a link to how wonderful it smells! Steps taken: The author recommends giving up fast food and prepared frozen meals, both of which I already avoid. I do plan to seek out organic produce and pasture raised meats. Comments: I am interested in local sources of meat and produce if anyone has suggestions. Comments: This was yesterday’s workout. I log my workouts on Fitocracy. Let me know if anyone wants an invite code. Oh, and PEM = Primal Essential Movement. Duration: I didn’t time it, maybe 15 min. Steps taken toward grand play outing: We brainstormed as a family at the dinner table and daughter #1 came up with geocaching. Comments: I really wanted to go caving (how can you get more Paleo than that? ), but I couldn’t risk my back going out in the cave. Im really excited for your brave commitment not to let ur back problems keep u down. I think u r taking good steps toward whole health. On meat source- I’ve been buying pastured beef, chicken, eggs, pork n lamb from Goose Pond Farm this year. Great quality from a rebel farmer in the likes of Joel Salatin if u can deal with the personality. Who knows maybe next year u can get some chicken, eggs and rabbit from me. We moved out to the county this summer to play homestead. Not sure I would call this a brave commitment. My back problems HAVE gotten me down, and this this is simply a desperate effort to restore my health. I have ordered meat from Goose Pond Farm in the past, but I no longer have a separate freezer, and we don’t have a good place to put one in this house. Also with the high gas prices it became prohibitively expensive, especially living on this end of town. I may look into getting chicken and eggs there again. Let me know if you have any to spare! That is so awesome that you are homesteading! We’ve gone geocaching! It’s fun. Geocaching is fun. And the c:geo Android app is great! Thanks for the tip, Angela! I’ll check out that app. I didn’t have a smart phone last time we went.